What is PLC 150T High Pressure Die Casting Machine used for? -PLC 150T high pressure die casting machine normally used to cast small aluminum alloy parts which dosage of per inject can be reach (Alu.)0.8/1.2/1.8KG. -PLC 150T high pressure die casting machine suitable for produce: Aluminum, Copper/brass, Magnesium, Zinc(Zamak), Lead(PB.) alloy parts of Automotive, motorcycle, filter, power tool, pneumatic tool, Electric power fittings , Door Closer, lamps and lanterns, explosion-proof products, pneumatic components, motor, diesel engine, gas oil machine, water pump, water heating equipments, desk & chair foots and arms, telecommunication,weapen etc military industrial and domestic lines. 1. Electrical System: adopts Mistsubishi, Omron or Schneider PLC control unit; casting parameters be adjusted from touch screen easily, which guarantee our 150t high pressure horizontal cold chamber die casting working with stable, fast, safe and operation more reliable and precision. 2. Pressure & Speed Control: 150T horizontal cold chamber die casting machine adopt Rexroth or Yuken proportional pressure valves and proportional direction valves, which have the functions of multi-stage pressure / speed control and mould clamping protect in low pressure. 3. Mould Platens: adopt High-quality nodular cast iron for mould platens which analysed and calibrated by finite-element method (FEM). All mould platens have features: reasonable pressure distribution, small deformation, high precison mould clamping. Whole 150T die casting machine mould platens also showed: high rigidity, good abrasive resistance. 4. Hydraulic Oil Pump: imported famous brand duplex vane pump with high-performance and low-noice be used in 150T PLC horizontal high pressure die casting machine. 5. Injection System: adopt independent accumulators, quick-injection and pressurize use newly developted rapid response throttle valves which increased the acceleration performance of quick-injection greatly, shorten the switching time of high-speed and pressurize. It is the symbol of advantageous injection performance of modern high quality PLC 150T Horizontal High Pressure Aluminum, Copper/brass, Magnesium, Zinc(zamak), Lead(Pb.) Metal Alloy Cold Chamber Die Casting Machine. 6. 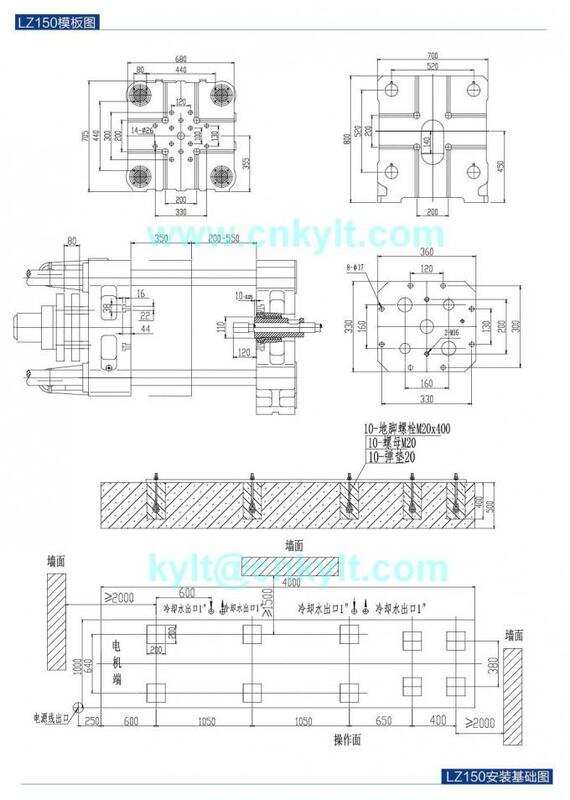 Lubrication System: adopt self-check joints, any blocks in oil passages can be respond fastly and easily. Underpressure protection system avoid the toggle parts of PLC 150T die casting machine damagned from oil starvation, extend the die casting machine using time. 7. Precison Die Casting Machine Parts: all parts of 150T die casting machine use CNC machining to guarantee precision. 8. Cold Assembly Processes: axle sleeves of 150T PLC die casting machine adopts cooling assembly method to avoid parts deformation in assembling which keep the whole precision of high pressure die casting machine. 9. Tie bars: High strength alloy steel tie bars, surface with hard chromium plating to insure the die casting machine mould platens moving more stable, tie bars more wearable. 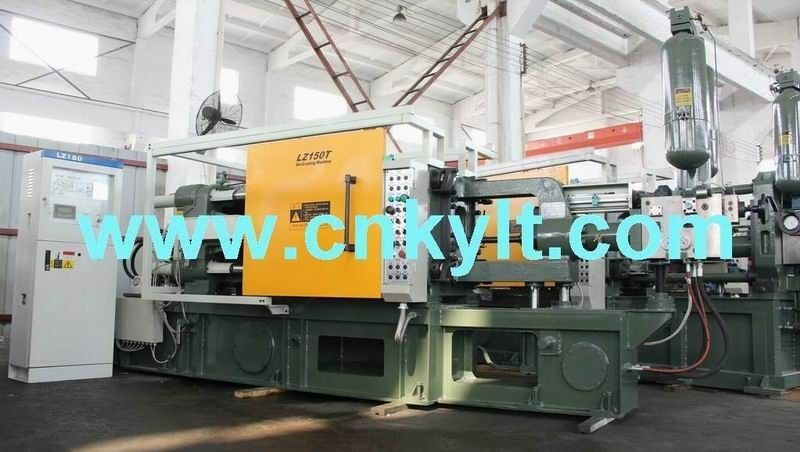 --PLC 150T DIE CASTING MACHINE JUST USE FAMOUS BRANDS SPARE PARTS.